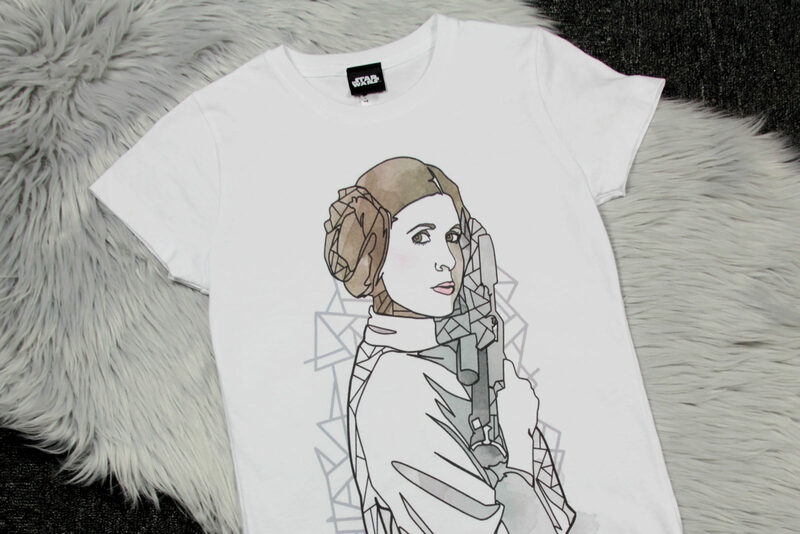 Today’s review features the women’s Fifth Sun x Star Wars Princess Leia t-shirt. As I already own a lot of Star Wars tops, a t-shirt has to be one of two things to stand out to me – unique and different to what I have, or be a fantastic celebration of a female Star Wars character. 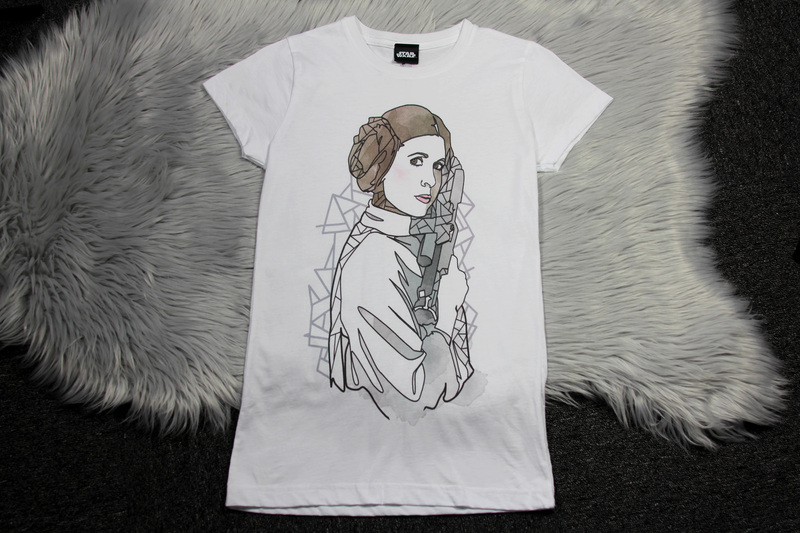 This beautiful Leia t-shirt is both! Show your love for Star Wars with this adorable vintage crew tee! The Leia Outline crew tee is made of Premium 30/1 Ringspun Cotton fabric so you’ll be sure to look your best while sporting this Star Wars style. Our junior’s tees are slim fit t-shirts. Available in sizes S to XXL, the t-shirt is priced at US$17.50 to US$23.94 each – due to licensing restrictions, Fifth Sun can only ship within the US (international customers can order from Amazon via a mail forwarding service). 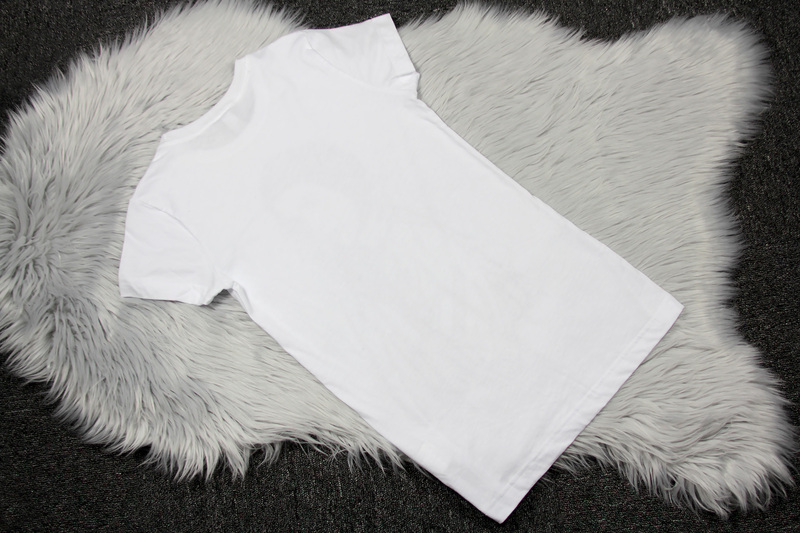 The Fifth Sun Princess Leia t-shirt is made from 100% cotton, noted as ‘ringspun’ cotton fabric, which is smoother and stronger than regular cotton fabric. The front print is soft, so it does not affect the drape of the fabric – I can barely feel the print running my hands over the fabric. 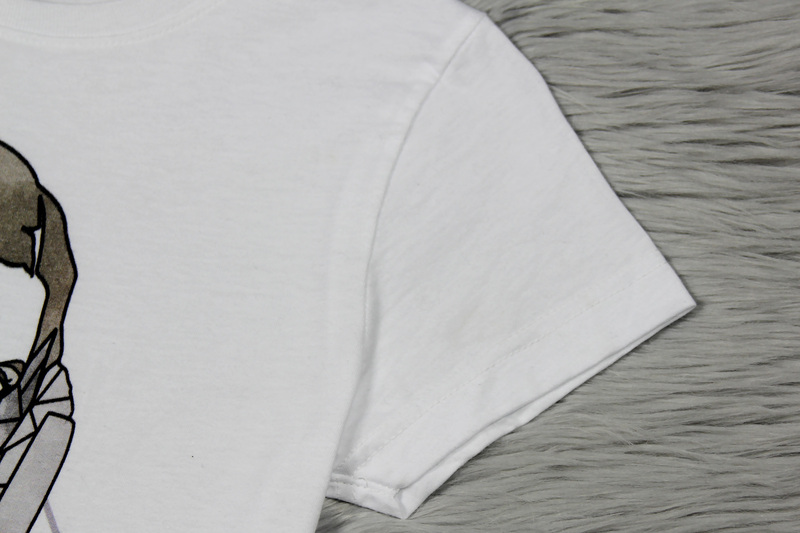 The texture just changes slightly in the darker, coloured in areas, but this is still very soft, especially compared to many other t-shirt prints. 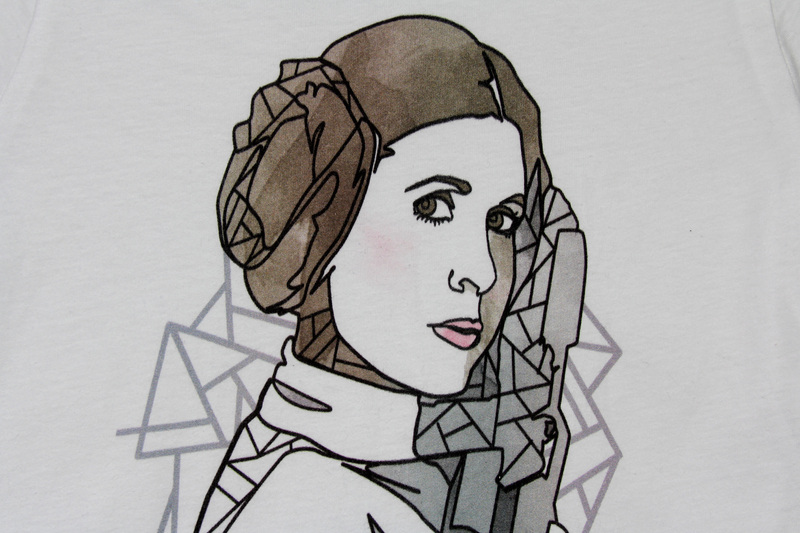 The main detail of this t-shirt is of course the Princess Leia artwork print on the front. The artwork has a geometric style, with bold black lines and angular shapes. The design is based on a promotional photo of Carrie Fisher as Princess Leia from A New Hope, complete with E-11 stormtrooper blaster. Despite being only line art, Leia’s eyes really capture your attention. 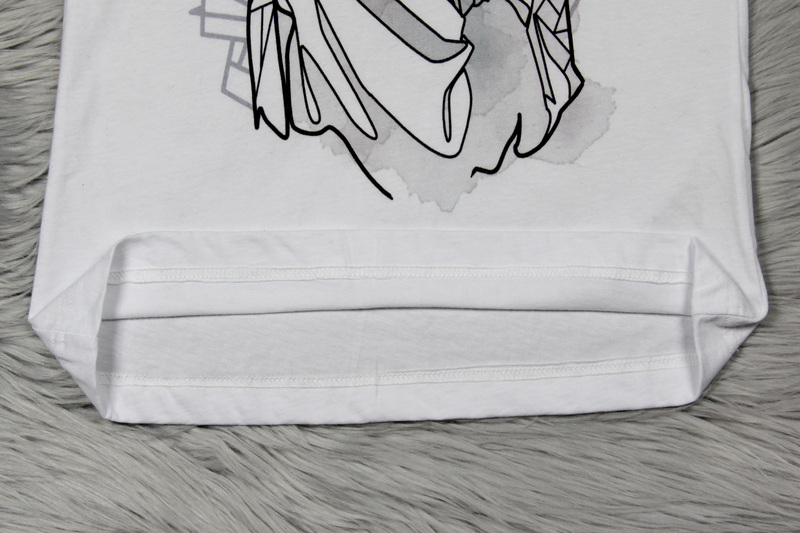 As Leia’s dress is white, this print works really well on this white t-shirt – the white areas of the print (dress/face) are left bare, so the fabric shows through. This helps keep the print nice and light, so it doesn’t affect the softness of the t-shirt fabric. Thinner prints like this are also less prone to ‘cracking’ when stretched, particularly across the chest on women’s garments. The artwork has a water colour style, with areas coloured in – mainly around Leia’s face and hair, but there is also grey shading on her blaster and around the bottom. The water colour style is most evident at the bottom of the print, where the colour ‘spills out’ deliberately around the lower edges. This really adds to the artistic appeal of the t-shirt design – normally I try to avoid white t-shirts (they show marks so easily), but for this design I can’t image anything else. The white fabric almost becomes paper, upon which an artist has painted this beautiful portrait. I particularly appreciate the lack of any other elements – like the Star Wars logo, or text. The sole focus is on the artwork, letting it stand on its own. Fifth Sun prints on t-shirts available from garment manufacturers – this particular t-shirt is made by LAT Apparel (LAT stands for ‘Live And Tell’). 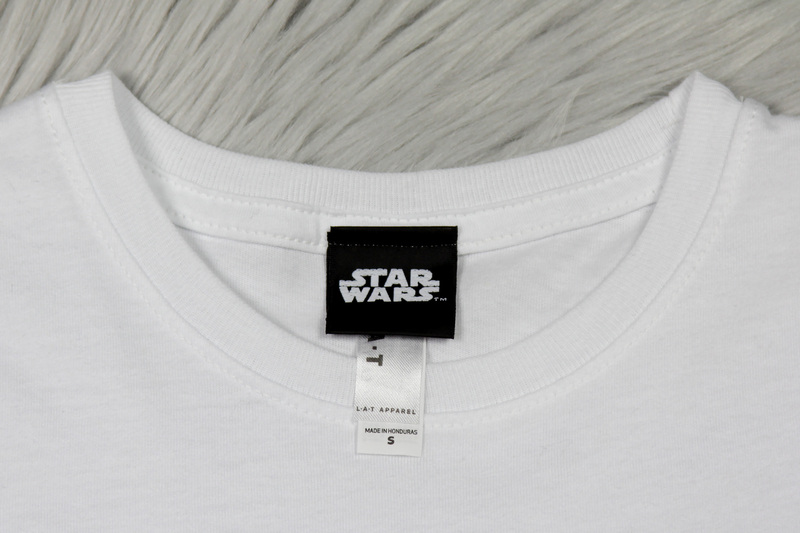 There is a black fabric Star Wars logo tag at the collar, along with tags noting the garment manufacturer, country of manufacture (Honduras), fabric composition (100% cotton), garment care instructions, and the size – in this case, size S.
This size S t-shirt measures approximately 39cm across the chest (underarm to underarm), and 40cm across the lower hem. This is a ‘slim fit’ style, so I would suggest sizing up if you prefer a more relaxed fit. This t-shirt has short fitted sleeves, which are finished off with a turned over seam and overlocking (serging) on the inside. This t-shirt is a ‘slim fit’ style, so the sleeves are more fitted than on a standard women’s cut t-shirt. On this size small t-shirt, the sleeve opening measures approximately 13.5cm across (laid flat). The bottom hem is also seamed neatly, overlocked (serged) and top stitched. As is usually the case with Star Wars printed t-shirts, the back is plain. A small white garment tag is sewn into the insider lower left side seam, which features the same information as the neckline tags (size, country of manfacture, fabric composition, garment care), as well as some in-house information like factory number and style number. As I mentioned earlier, I am always on the look-out for interesting t-shirts, something unique and different than what I already own. Combined with my ever-ongoing quest to add more Princess Leia themed fashion to my wardrobe, this was a must-have. 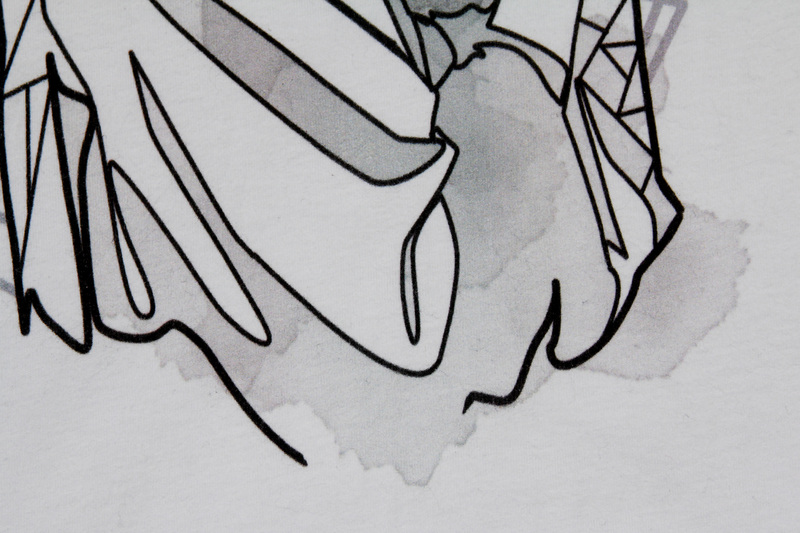 The artistic print works so well with a plain white t-shirt – not something many designs can achieve. This tee is already a favourite of mine, capturing Leia’s beauty and strength – a fantastic item to celebrate my love of Princess Leia and Carrie Fisher. Disclaimer: this item was supplied by Fifth Sun for review purposes. The Kessel Runway stands by the position that this, and all of our reviews, are an honest analysis and opinion regardless of whether the merchandise was purchased or supplied by a manufacturer/retailer.